In a new series, IFLR brings together the world's leading lawyers to discuss the hot topics of the day in an interactive forum. 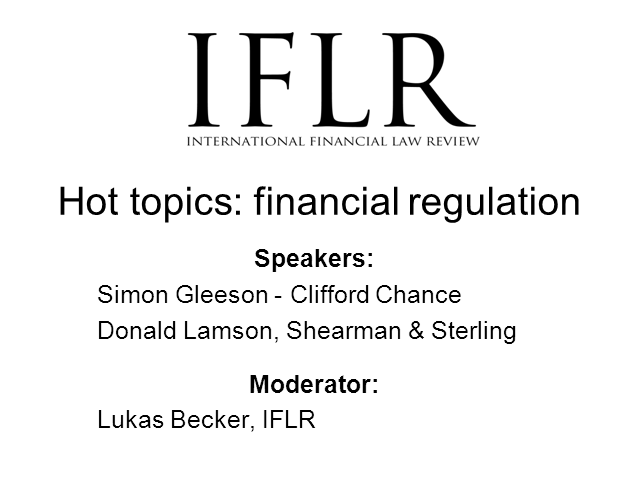 In this session, Simon Gleeson of Clifford Chance, Donald Lamson of Shearman & Sterling and Lukas Becker of IFLR tackle three of the most talked-about topics in financial regulation. Derivatives reform: Dodd-Frank/Emir - what are the outstanding issues? Ratings agencies: What are the alternatives? Bank regulation: Volcker Rule DOA?, and the future for hybrid capital. The session is fully interactive and speakers will take questions throughout so please feel free to join in. This webinar will provide an update on derivatives regulatory developments in the EU and the US, addressing the implications of Brexit for derivatives, as well as recent developments relating to the CFTC’s regulations for swaps and the SEC’s regulations for security-based swaps. The webinar will update viewers on the status of the LIBOR transition process globally, paying attention to the US, English, Asian, and EU markets. The webinar will summarise the results of the various market consultations, investigate how documentation is being affected, and explore issues relating to harmonisation with loan and other markets. In the wake of the global financial crisis, the Financial Stability Board (FSB), with the support of the G20 nations, launched its Shadow Banking initiative, to monitor non-banks that perform bank-like activities. This was in response to findings that certain non-banks exacerbated the build-up of excessive leverage and effected substantial maturity transformation, leading to financial stability concerns. One of the key recommendations emerging from the FSB initiative was the collation and monitoring by financial stability authorities of data on securities financing transactions. Following the FSB initiative, the Securities Financing Transactions Regulation (SFTR) was introduced in the EU in 2016, but is not yet fully operational. Coaching is now a key component of many development packages, but do we really understand what it is and how to use it to our advantage? - What is coaching and what isn’t coaching? - What type of challenges and goals can coaching help with? - What happens in the coaching process? - How do you find a coach and assess whether they are the right fit for you? Risk retention requirements, or 'keeping skin in the game' were intended as a means of addressing the misalignment of incentives that were inherent in many of the 'originate to distribute' securitisation products. Has the aim been achieved and how have these requirements developed in the US and in the EU? · new regulatory framework for securitisations transactions in the EU. This webinar has CLE accreditation. · Timetable for benchmark administrators to be authorised under the regulation and the extent to which administrators of pre-existing benchmarks can rely on 'grandfathering' relief up until 2020. · What indices are within the scope of the Regulation and when will an index be regarded as 'available to the public'? · What is meant by 'use' of a benchmark in the EU? · Are there any regulatory obligations on entities that contribute benchmark data? · What is the impact of Brexit on UK benchmark administrators? - BRRD and its implications: how the rules affect structuring and the mitigating techniques investors may explore. This webcast will discuss the latest developments related to initial coin offerings (also known as ICOs or token offerings), which are dramatically changing the ways in which organisations raise capital. - Recent SEC enforcement action regarding cyber risk disclosure. - current proposals regarding the supervision of central counterparties and potential amendments to Emir. - the CFTC’s order exempting EU trading facilities from the requirement to register with the CFTC, comparability determination with respect to the EU margin rules and extension of existing relief in relation to swaps data reporting. · legislative proposals relating to the securities laws. Best practices in public debt communications (as a private company). Token sales, also known as ICOs, represent a new capital-raising method that is being explored by a variety of companies in the market. In the past few months, the US Securities and Exchange Commission (SEC) has provided guidance concerning token sales. Although the SEC did not declare that all digital tokens constitute securities, it cautioned that certain tokens may be securities and that existing securities frameworks apply to token sales, notwithstanding that digital tokens may be distributed via distributed ledger technology. In addition, the IRS has published guidance relating to tokens that are “convertible virtual currencies” and has indicated that such tokens generally are treated as property for US federal income tax purposes. Token sales, and the legal and regulatory landscapes in the US and around the world with respect to digital tokens, continue to evolve. •What are digital tokens and how are they typically used and sold? •What guidance has the SEC provided regarding token sales, and what is the significance of that guidance? •What guidance has the IRS provided regarding tokens and what tax considerations are relevant to tokens and token sales? •What are some of the other legal matters that token issuers and their counsel should be aware of when contemplating launching token sales? · the likely path forward for regulatory reform and what you should expect in 2017. The first phase of the Department of Labor’s (DOL) new fiduciary rule (Fiduciary Rule) was implemented on June 9 2017. The Fiduciary Rule greatly expands the categories of persons who are deemed fiduciaries when dealing with retail retirement investors. Many investment professionals will now be deemed fiduciaries and need to comply with the new standards. Join Morrison & Foerster and the ACA Compliance group for this timely webinar in conjunction with the International Financial Law Review. · Legal liability and potential litigation. The webinar will discuss the current state of fintech services in the US, including state licensing requirements, bank partnership arrangements, and the potential for special purpose bank charters at both the state and federal levels. After the 2016 decline in the number of US initial public offerings (IPOs), commentators questioned whether the trend toward companies deferring listings and remaining private longer would be a new norm. •The resolution process for GSIBs. What is the current position in relation to exchange trading of derivatives – in particular, what effect will Mifid II have in the EU? Where are we on substituted compliance/equivalence as between the US and the EU? Will Brexit and/or the new Trump administration have any effect on the international framework for derivative regulation?